Mold gold cape - Celtic Welsh Legacy - Egyptian Lingua-franca? Why on Earth would Free Planet want to suggest that a bronze-age shoulder decoration called the Mold Gold Cape that was found in Wales should have ANYTHING TO DO WITH Ancient Egyptian Burial Practices? Wales is so out of place, geographically and spiritually from the Ancient Empires of north Africa i.e. Egypt. 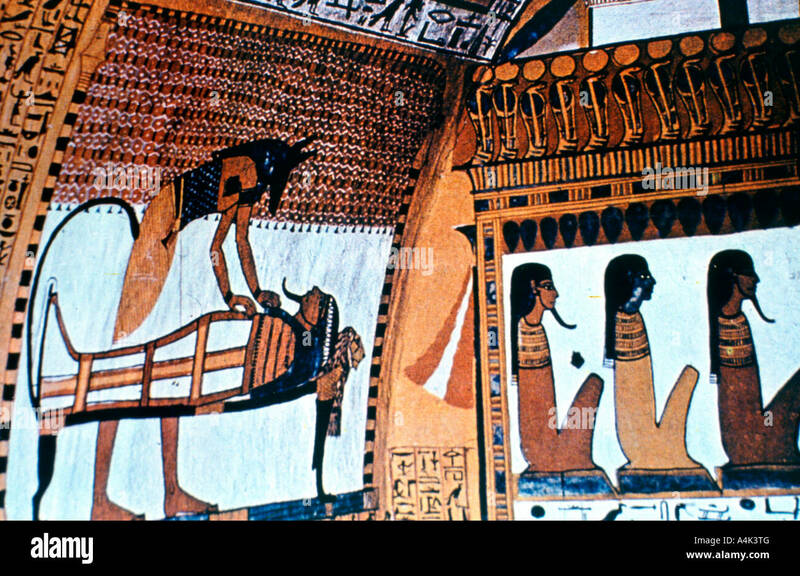 But notice if you will (in the image below from the Chapel of Anubis in Thebes) the three seated figures, wearing what looks like the exact same shoulder-restraining decorated wraparound decoration. And one can easily travel by boat from Egypt (or anywhere in the Mediterranean) to Wales via the Iberian i.e. Atlantic, coast. Unless, of course, this style of bejewelled precious metal adornment was introduced into Egypt BY the Celts of Briton via their Atlantic-coast or Pillars of Hercules trading partners, the Iberians. In fact, one of the earliest written inscriptions dedicated to the Celts comes courtesy of the people of this southern Iberian region. But it's not written in Celtic... like many other later Celtic inscriptions that have Roman or Latin characters... this earliest piece appears to be written in the adoptive language of Phoenician. 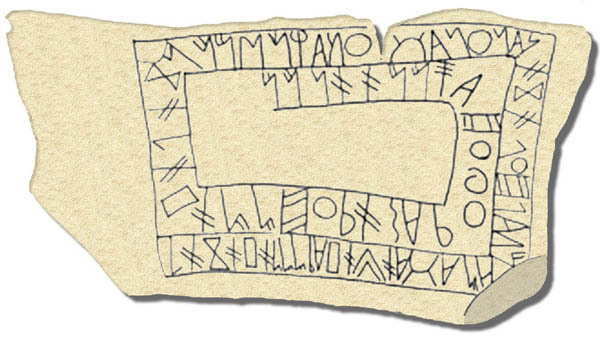 Found at Fonte Velha in southwest Portugal, in a necropolis or Bronze Age burial ground, the Tartessos stone inscription is said to be in an early form of Phoenician or Thracian. 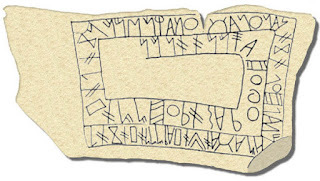 But Alan Wilson and Baram Blackett have already identified this as The Khumric Alphabet that make these inscriptions readable when translated directly into Welsh via The Coelbren Cypher, which Free Planet has already covered. 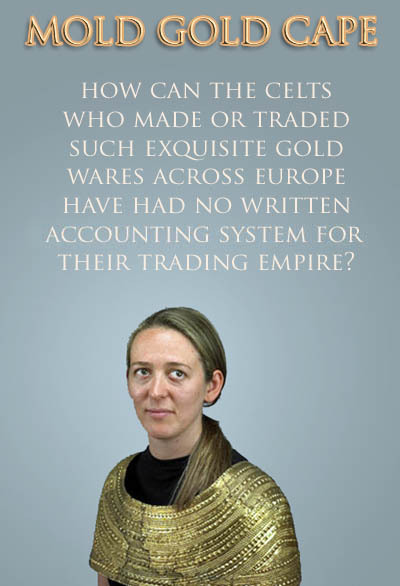 And, thus, onto the obvious and luring question about 'the lost script of the celts', "How can such a vast trading empire as the Celts or the Keltoi or the Khumric spreading east from Briton to the Balkans have had NO WRITTEN COMPONENT of its CTL or Celtic Trade Language," surely the accountants (or whatever faction of the Druid Tripartite) would have insisted on some form of rows-n-columns account-ability? 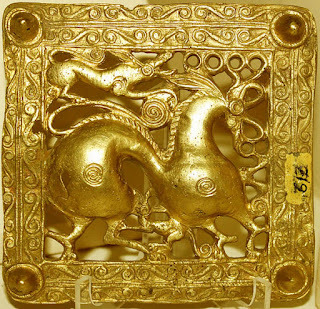 FURTHER MORE: here's a Celtic-styled gold-carved belt buckle from 700 BC. Was it found in Briton? Was it found in Norway? No, it was found in the geographical context as what's been called the Scythians i.e. northeastern Turkey in its original Herodotus-mentioned iteration. This is before the Scythians moved into the Indus Valley to the northwest of India. Five hundred years after the Mold Gold Cape was laid into the ground in Wales, is this a societal pointer to what happened to the Mold Gold Cape's skilled artisans?